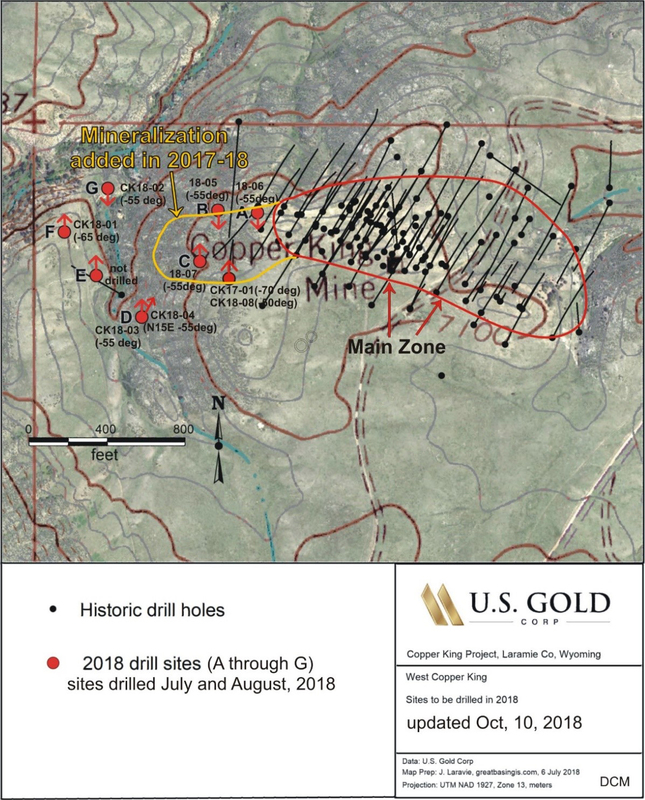 ELKO, Nevada, October 17, 2018 – U.S. Gold Corp. (NASDAQ: USAU - http://www.commodity-tv.net/c/search_adv/?v=298583 ) today is pleased to announce the results of the recent eight-hole reverse circulation drilling program that followed up the discovery of this mineralization in last year’s drill hole CK17-01rc, reported January 30, 2018. These eight new holes (see Table 1 below) indicate that the Copper King mineralization extends to the west, at least 200 meters, and maintains the historically measured and reported widths and depth to the deposit (see updated Copper King deposit map link below). Forward-looking statements in this press release and all other statements that are not historical facts, are made under the safe harbor provisions of the Private Securities Litigation Reform Act of 1995. These statements involve factors, risks, and uncertainties that may cause actual results in future periods to differ materially from such statements, including statements related to the potential increase of the overall metal endowment of the project and use of updated digital exploration model to assist in identifying deposit extensions and high-grade target zones. There are a number of factors that could cause actual events to differ materially from those indicated by such forward-looking statements. These factors include, but are not limited to, risks arising from: whether or not U.S. Gold Corp. will be able to raise capital through this offering or consummate this offering, the satisfaction of customary closing conditions, prevailing market conditions, the anticipated use of proceeds from the offering and the impact of general economic industry or political conditions in the United States or globally. A list and description of these and other risk factors can be found in the Company’s most recent Annual Report on Form 10-K, Quarterly Reports on Form 10-Q, and Current Reports on Form 8-K filed with the Securities and Exchange Commission, which can be reviewed at www.sec.gov.. We make no representation or warranty that the information contained herein is complete and accurate and we have no duty to correct or update any information contained herein.